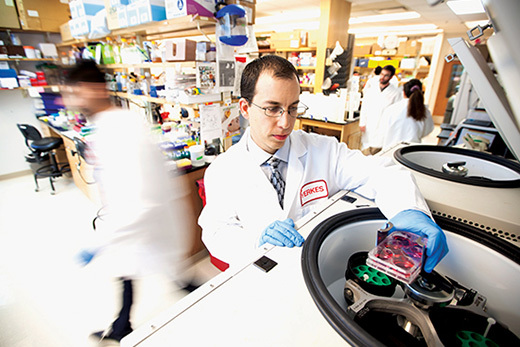 As director of Emory's Antibiotic Resistance Center (ARC), David Weiss leads a multidisciplinary team that means to outpace wily bacteria. Penicillin was hailed as a “miracle drug” when it went into widespread use in the early 1940s, and with good reason. Before then, even simple infections frequently led to more serious illness, even death. But with the emergence of antibiotic-resistant bacteria in recent years, medical science could find itself back at square one again—but a group of Emory researchers is determined to prevent that from happening. According to David Weiss, director of the Emory Antibiotic Resistance Center (ARC), there are patients in hospitals around the world who are grappling with infections that no antibiotic will cure. In the US, the Centers for Disease Control and Prevention (CDC) reports there are 2 million antibiotic-resistant infections every year resulting in 23,000 deaths. Weiss and other ARC researchers are investigating ways to alleviate this situation, brought about by the conspicuous overuse of the miracle drug and its progeny, which in turn has led to bacteria developing an immunity to antibiotics. In addition, according to Weiss, few pharmaceutical companies have shown an interest in researching new antibiotics, which are costly to develop and don’t offer a big financial payback compared to so-called “blockbuster” drugs.